Defined by an unmistakable ‘Smeg’ aesthetic, this 60cm built-in oven is a truly magnificent feat of design that brings forth the Italian manufacturer’s peerless manufacturing standards and dedicated pursuit of quality. Finished in stunning stainless steel, and balanced perfectly by an eye-catching ‘eclipse black’ glass panel, this classic aesthetic, pyrolytic oven is a fitting visual complement for modern kitchens of all shapes, sizes and styles. 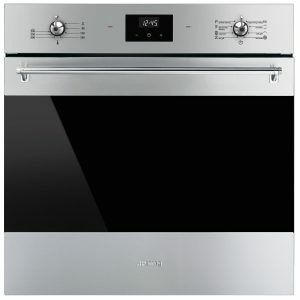 Intended as a companion appliance for keen home chefs looking to expand their culinary horizons, this oven features the innovative Thermoseal, which creates a controlled, consistent atmospheric cooking environment – meaning your crusts will be crispier and your roasts more succulent – leaving your guests wanting more. Additionally, Smeg’s pyrolytic program facilitates easy and efficient maintenance – applying temperatures of up to 500°C to the oven interior, burning any residue to ash so the cavity wipes away clean, a superb asset for those that regularly cook at home or those that frequently entertain. A truly modern cooking solution designed for modern living, the SFPA6300X is a refined and sophisticated oven that represents the height of both style and substance.